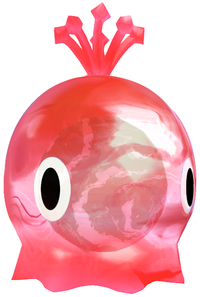 A Swoopin' Stu is a type of transparent creature that appears in the game Super Mario Sunshine. Swoopin' Stus can be found wherever there is toxic Graffiti. They resemble transparent Flapjack Octopuses with a ball of goop within their bodies. They come in a large variety of colors, as well as some size variation, although they all act exactly the same. For the most part, unless Swoopin' Stus see Mario, they will generally wander in an outward direction without any real, apparent purpose and will not create a larger 'Goop area' unless they fall off a ledge and pop on impact. Petey Piranha's Goop is also capable of creating Swoopin' Stu. Once a Swoopin' Stu spots Mario, they will turn white for a second before making a "bwooww-wop" noise and swooping at him, then splattering, leaving goop behind. They appear prominently during battles with Polluted Piranhas, spawned from their base, swooping at Mario whenever they have the chance and disrupting his own attacks on the Polluted Piranha. Swoopin' Stu can be destroyed with a blast of water from F.L.U.D.D. or by being Jumped on, though the latter method will leave behind a puddle of Goop that can spawn more Swoopin' Stu. This can be avoided, however, if they are jumped on while they are in the air. Stomping on them also causes them to occasionally drop Water Bottles. Eventually, Swoopin' Stu pop even without provocation but will not leave Goop. Swoopin' Stus were originally intended to have a more slug-like design in the game, but their design was changed in the final version. This page was last edited on April 12, 2019, at 12:54.